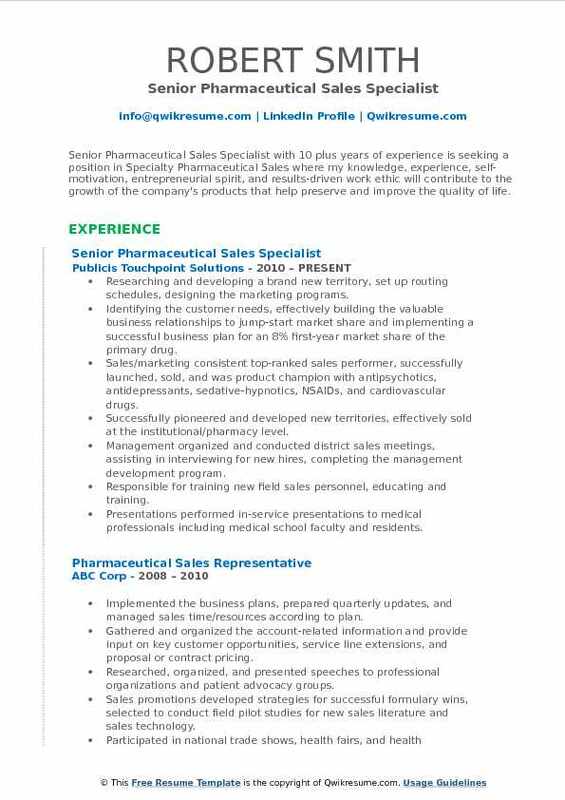 A Pharmaceutical Sales Specialist (PSS) is responsible for contacting healthcare professionals’ face-to-face to sell the assigned product. 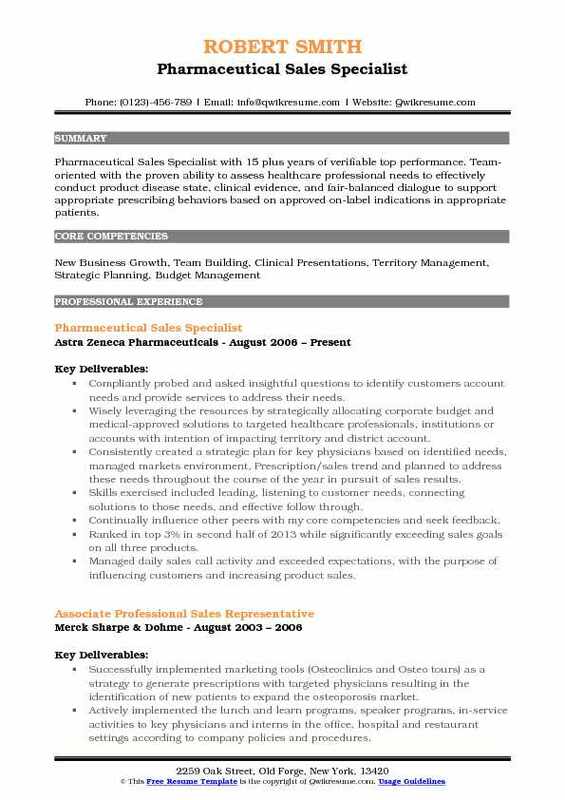 A well-refined Pharmaceutical Sales Specialist Resume highlights job duties such as – developing and maintaining a relationship with healthcare professionals, creating and developing effective sales strategies, managing daily sales, managing promotional budgets, understanding customers needs, and questions, product promotions activities, maintaining competent product level and educating customers about the product and its specifications. To become a successful PSS, candidates have to groom their skills and show proficiency in databases, product lines, latest medical issues, and statistics; they should have good working experience in the same line and depict strong negotiation and communication skills. As this job requires frequent traveling, the candidates should have a travel and driving passion too. Most of the pharmaceutical sales specialists have a degree in science or health-related field. 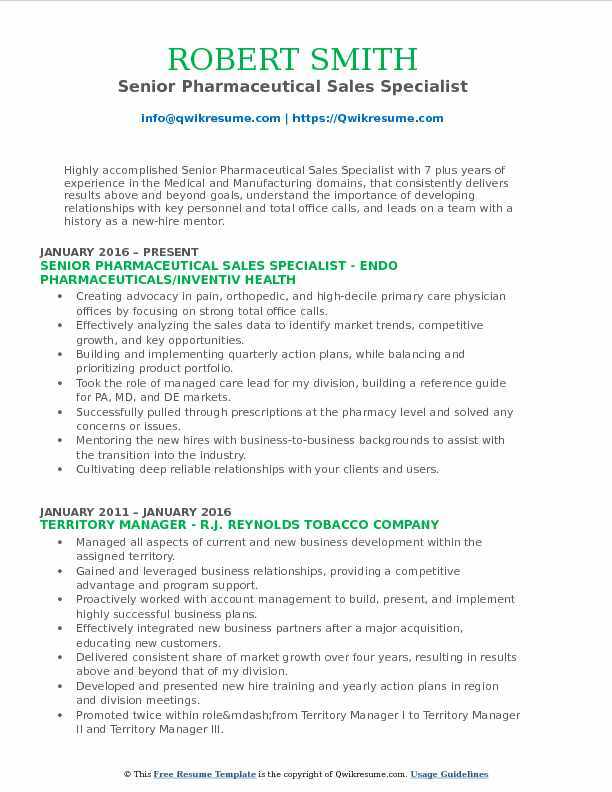 Summary : A strategic-thinking, award-winning, self-motivated Pharmaceutical Sales Specialist I with 11 plus years of experience, with a passion for disease treatment and the patient journey seeking a sales position to drive sales in the most focused, effective way possible. Proven track record of sales success despite increasingly challenging market obstacles. I have a strong ability to analyze the market and I ambitiously seize opportunities. I am drawn to challenging myself and those around me. Proactively identified business opportunities through strategic account planning and business analysis. Developed territory business plans through strategic market analysis, a clear understanding of the increasingly challenging payer landscape, and proactive identification of the customers’ needs. Used analytical thinking style to maintain a thorough knowledge of my business and priorities. Collaborated across functional teams to ensure performance measures were exceeded. Impacted the district and region through various projects aimed at improving business acumen, ensuring successful product launches, and growing market share. Selected to participate in the inaugural regional development program - a program for high performers to improve their readiness for career advancement and accelerate their career pathway. Selected by DSM to serve as the 1AZ selling framework champion for the district, 2016. 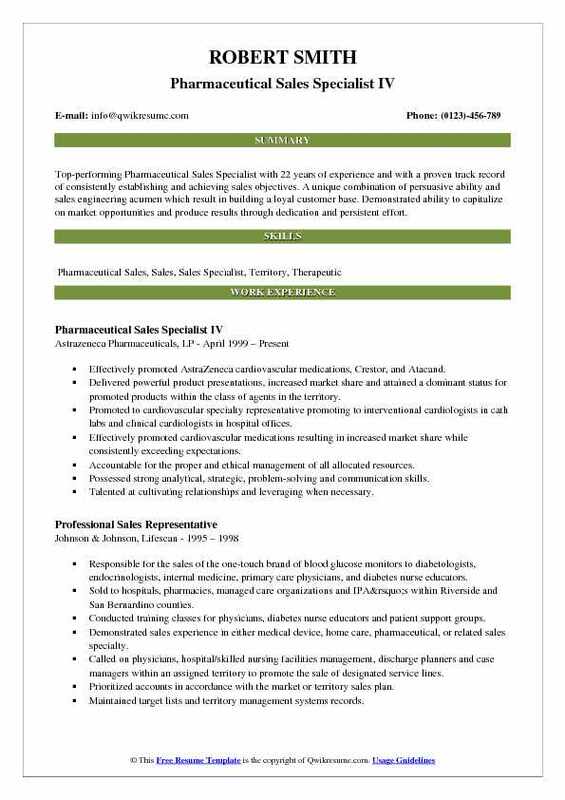 Summary : Pharmaceutical Sales Specialist II with 15 years of experience in the Sales domain is seeking to use my successful experience in healthcare sales to contribute to an aggressive, sales oriented pharmaceutical/medical firm, and continue my development as a medical sales professional. Responsible for the promotion of branded pharmaceutical products to primary care physicians, internal medicine, and cardiologists in Baltimore and Wilmington sales territories. Demonstrating exceptional analytical skills established as District Touchstone Reports Champion. Managing the market expertise established through duties as district managed markets champion. Coordinating and participating in the speaker programs to increase awareness and comprehension of product knowledge. Implementing the sales promotion plan and utilizing the strong relationship building skills to differentiate products from competitors. Utilizing the regional scientific managers, managing the market specialists, and product leaders to help educate physicians about the cardiovascular line of products. Attending and worked in the booth at numerous conventions to spread awareness of AstraZeneca product line. 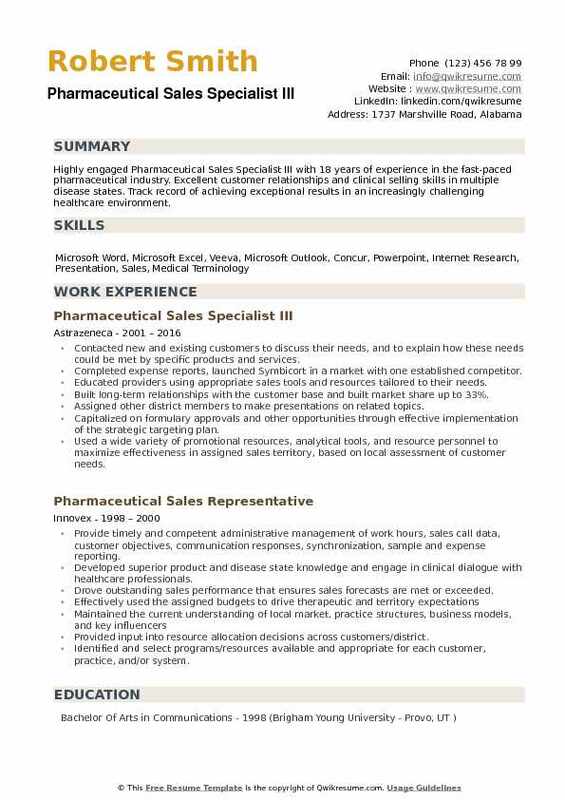 Summary : Top-performing Pharmaceutical Sales Specialist with 22 years of experience and with a proven track record of consistently establishing and achieving sales objectives. A unique combination of persuasive ability and sales engineering acumen which result in building a loyal customer base. Demonstrated ability to capitalize on market opportunities and produce results through dedication and persistent effort. Effectively promoted AstraZeneca cardiovascular medications, Crestor, and Atacand. Delivered powerful product presentations, increased market share and attained a dominant status for promoted products within the class of agents in the territory. Promoted to cardiovascular specialty representative promoting to interventional cardiologists in cath labs and clinical cardiologists in hospital offices. Effectively promoted cardiovascular medications resulting in increased market share while consistently exceeding expectations. Accountable for the proper and ethical management of all allocated resources. Possessed strong analytical, strategic, problem-solving and communication skills. Talented at cultivating relationships and leveraging when necessary. Worked with the Area Sales Director and Regional Sales Manager to develop a local business plan that ensures achievement of all KPI goals and delivery on all sales objectives. Prepared the annual territory business plans for Supervisor or Manager's review or approval. Summary : Senior Pharmaceutical Sales Specialist with 10 plus years of experience is seeking a position in Specialty Pharmaceutical Sales where my knowledge, experience, self-motivation, entrepreneurial spirit, and results-driven work ethic will contribute to the growth of the company's products that help preserve and improve the quality of life. Researching and developing a brand new territory, set up routing schedules, designing the marketing programs. Identifying the customer needs, effectively building the valuable business relationships to jump-start market share and implementing a successful business plan for an 8% first-year market share of the primary drug. Sales/marketing consistent top-ranked sales performer, successfully launched, sold, and was product champion with antipsychotics, antidepressants, sedative-hypnotics, NSAIDs, and cardiovascular drugs. Successfully pioneered and developed new territories, effectively sold at the institutional/pharmacy level. Management organized and conducted district sales meetings, assisting in interviewing for new hires, completing the management development program. Responsible for training new field sales personnel, educating and training. Presentations performed in-service presentations to medical professionals including medical school faculty and residents. Conducting presentations to peers, preparing and executing the presentations to sales leadership. Summary : Pharmaceutical Sales Specialist I with 14 years of experience is seeking to obtain a pharmaceutical or medical sales position with a progressive company providing me with an opportunity for significant contributions to the success of the organization while promoting personal and professional growth. Motivated, Persuasive, Self-starter, Creative Team Player, Thrives on the Challenge of Exceeding Set Goals. Responsible for bringing value to clinics through exceptional product knowledge and relevant information in a fashion that builds a positive relationship with the customers. Responsible for various specialties such as cardiologists, family practice, and internal medicine. Experienced in clinical presentations to retail and hospital pharmacists. Creating and leading the strategic coordination of sales efforts for central Arkansas territory. Awarded “Being the Best Award” three times for my contribution and impact on my territory and district. Successfully launched Onglyza and Kombiglyze XR with currently 52 physicians prescribing. Gathering and organizing the information on targeted accounts for use in proposal or contract pricing. Forwarding the information to appropriate management and staff to ensure consistency and profitability, and track actual sales to account targets. Summary : Extremely motivated Pharmaceutical Sales Specialist with 12 plus years of experience, proficient in building and leading integrated sales operations and increasing revenue for a major pharmaceutical company. Accomplished in developing strong clinical knowledge along with strategic targeting skills. Successful in building and expanding accounts with a proven track record of surpassing market share goals. Responsible for managing the business of assigned Denver territory and exceeding sales objectives for a reference specialty pharmaceutical company providing innovative, effective therapies for unmet medical needs, including cystic fibrosis and gastrointestinal disorders. Successfully launched new product Rectiv to the Gastroenterologist and Colorectal surgeons. Successful account management of national Jewish, children's Colorado, and university. Built productive relationships with pharmacy directors at hospitals, market, and trade relations, members of the pharmacy and therapeutics committee, and influential members of the medical community to secure Aptalis products on hospital formularies. Led numerous promotional events including patient education nights, staff education. Developing and implementing a business plan to drive growth in the territory, with a specific focus on the growth of payer-covered tests. Building the effective business relationships with healthcare professionals including physicians, allied health professionals, and medical staff. 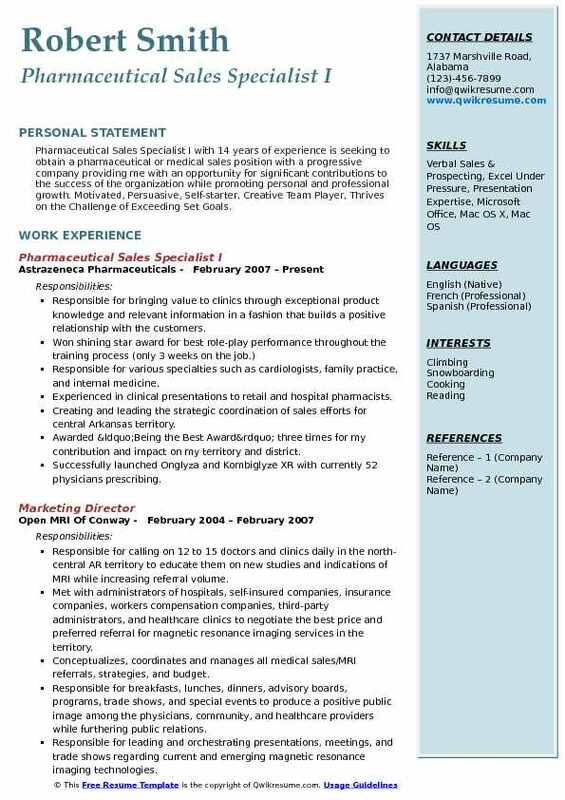 Summary : Highly accomplished Senior Pharmaceutical Sales Specialist with 7 plus years of experience in the Medical and Manufacturing domains, that consistently delivers results above and beyond goals, understand the importance of developing relationships with key personnel and total office calls, and leads on a team with a history as a new-hire mentor. Creating advocacy in pain, orthopedic, and high-decile primary care physician offices by focusing on strong total office calls. Effectively analyzing the sales data to identify market trends, competitive growth, and key opportunities. Building and implementing quarterly action plans, while balancing and prioritizing product portfolio. Took the role of managed care lead for my division, building a reference guide for PA, MD, and DE markets. Successfully pulled through prescriptions at the pharmacy level and solved any concerns or issues. Mentoring the new hires with business-to-business backgrounds to assist with the transition into the industry. Cultivating deep reliable relationships with your clients and users. Qualifying and prioritizing the client visits to maximize revenue potential. Understanding each prospect’s unique needs and be prepared to deliver desired value. Received performance awards for “Leadership”, “Teamwork”, and “Results Driven” categories throughout 2016. 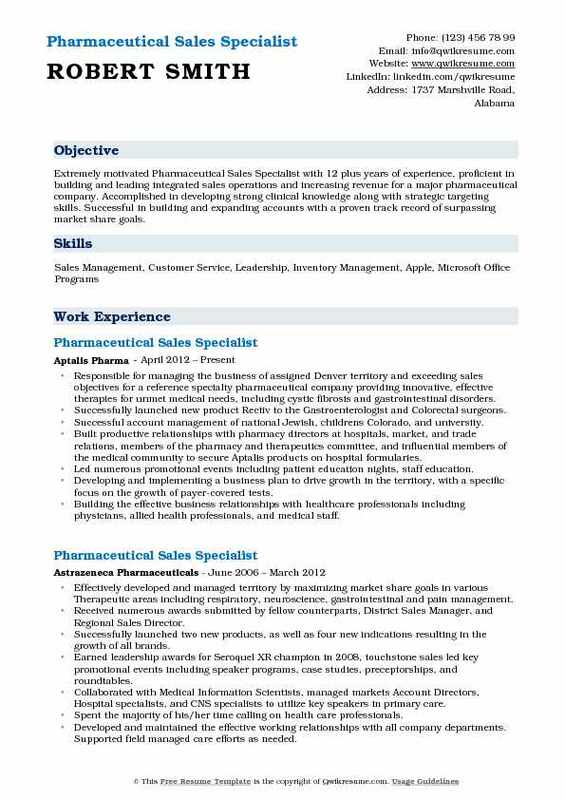 Summary : Pharmaceutical Sales Specialist with 15 plus years of verifiable top performance. Team-oriented with the proven ability to assess healthcare professional needs to effectively conduct product disease state, clinical evidence, and fair-balanced dialogue to support appropriate prescribing behaviors based on approved on-label indications in appropriate patients. Compliantly probed and asked insightful questions to identify customers account needs and provide services to address their needs. Wisely leveraging the resources by strategically allocating corporate budget and medical-approved solutions to targeted healthcare professionals, institutions or accounts with intention of impacting territory and district account. Consistently created a strategic plan for key physicians based on identified needs, managed markets environment, Prescription/sales trend and planned to address these needs throughout the course of the year in pursuit of sales results. Skills exercised included leading, listening to customer needs, connecting solutions to those needs, and effective follow through. Continually influence other peers with my core competencies and seek feedback. Ranked in top 3% in second half of 2013 while significantly exceeding sales goals on all three products. Managed daily sales call activity and exceeded expectations, with the purpose of influencing customers and increasing product sales. 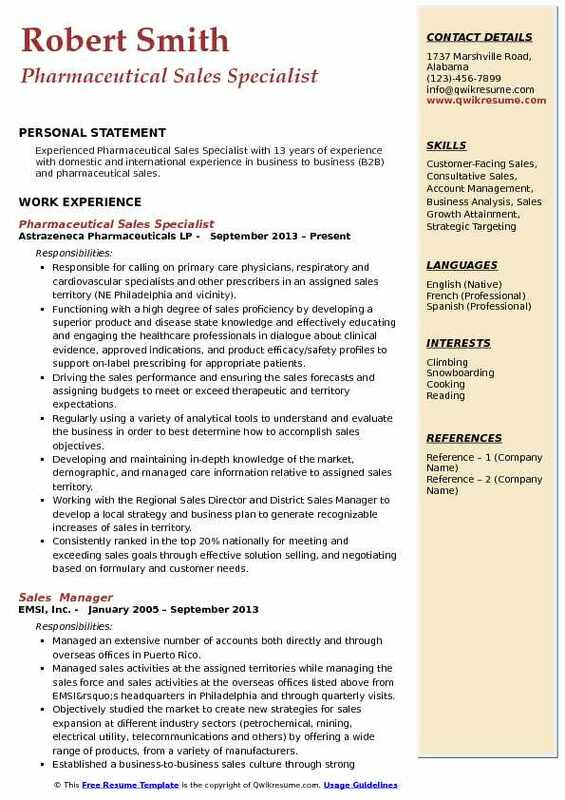 Summary : Experienced Pharmaceutical Sales Specialist with 13 years of experience with domestic and international experience in business to business (B2B) and pharmaceutical sales. Responsible for calling on primary care physicians, respiratory and cardiovascular specialists and other prescribers in an assigned sales territory (NE Philadelphia and vicinity). 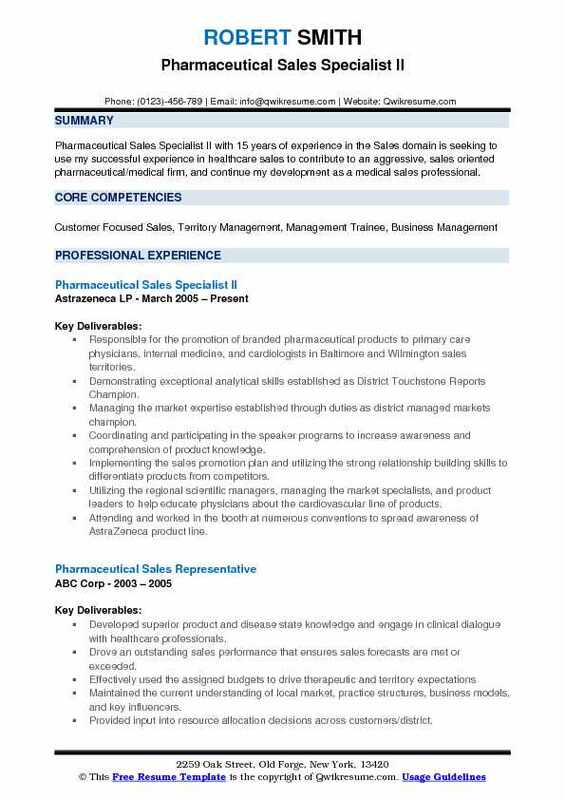 Functioning with a high degree of sales proficiency by developing a superior product and disease state knowledge and effectively educating and engaging the healthcare professionals in dialogue about clinical evidence, approved indications, and product efficacy/safety profiles to support on-label prescribing for appropriate patients. Driving the sales performance and ensuring the sales forecasts and assigning budgets to meet or exceed therapeutic and territory expectations. Regularly using a variety of analytical tools to understand and evaluate the business in order to best determine how to accomplish sales objectives. Developing and maintaining in-depth knowledge of the market, demographic, and managed care information relative to assigned sales territory. Working with the Regional Sales Director and District Sales Manager to develop a local strategy and business plan to generate recognizable increases of sales in territory. Consistently ranked in the top 20% nationally for meeting and exceeding sales goals through effective solution selling, and negotiating based on formulary and customer needs. 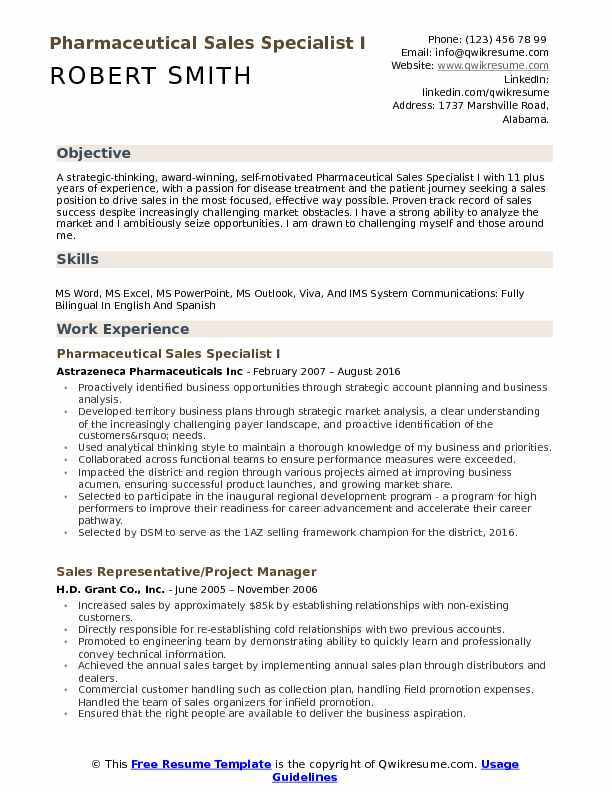 Summary : Highly engaged Pharmaceutical Sales Specialist III with 18 years of experience in the fast-paced pharmaceutical industry. Excellent customer relationships and clinical selling skills in multiple disease states. Track record of achieving exceptional results in an increasingly challenging healthcare environment. Contacted new and existing customers to discuss their needs, and to explain how these needs could be met by specific products and services. Completed expense reports, launched Symbicort in a market with one established competitor. Educated providers using appropriate sales tools and resources tailored to their needs. Built long-term relationships with the customer base and built market share up to 33%. Assigned other district members to make presentations on related topics. Capitalized on formulary approvals and other opportunities through effective implementation of the strategic targeting plan. Used a wide variety of promotional resources, analytical tools, and resource personnel to maximize effectiveness in assigned sales territory, based on local assessment of customer needs. Provided special education to healthcare providers through appropriate programs that fall within AstraZeneca's ethical guidelines. Worked with other pharmaceutical sales specialists around common objectives to coordinate selling efforts and grow market share.